Smarkets vs Betfair: Which betting exchange suits you best? Betfair has ruled pretty much unchallenged as the best betting exchange for some time now, but recent years have seen some interesting new alternatives emerge, like Smarkets. Let’s take a look at how this up-and-coming betting exchange compares with the all-time favourite. That’s right, it’s Smarkets vs Betfair! The Betfair promo initially appears more favourable as it has a higher value of £100, compared with £10 for Smarkets. But you'll need to place several bets to get it. On the other hand, Smarkets will give you £10 risk-free (minimum £20 first deposit required) regardless of how long it takes for you to redeem it. Your first few bets could win, but the £10 refund will still come into play once you make a loss on a market. New customers only. 18+. To qualify for initial £10 welcome bonus you must deposit a minimum of £20 by card or bank transfer as your first transaction when you sign up. Deposit made with Skrill, Neteller or a virtual/prepaid card will not qualify for this promotion. Once added to your account, the welcome bonus will automatically refund your first net market loss or losses to your account in cash up to the value of £10. Unused bonuses expire after three months of being credited to a user account and will be removed after this period. T&Cs apply. Whether signing up with Smarkets or Betfair, you’ll have a risk-free bet when you sign up to the website. However, we have to conclude that the Smarkets welcome promo is more favourable to new players signing up. Betfair has just as many sports available to bet on with its exchange product as on its sportsbook. Over 30 are listed, from the most mainstream betting events like racing, football and tennis, to more obscure disciplines like chess and pool. What’s more, there is a great variety of betting markets within a lot of those events too. Football matches have all the main markets like match winner, over/under, HT/FT etc., but also a host of other team, goal, score, cards and corners markets. Of course, not every event will have great liquidity on it, but that’s down to people’s betting interests rather than anything Betfair can control themselves. 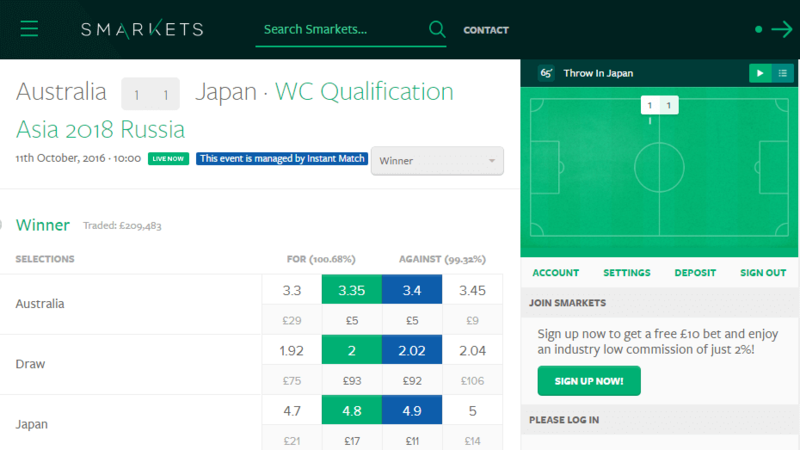 Smarkets, meanwhile, has a simple layout, with sport sections added or removed as betting on an event becomes available. We noticed that on the build-up to a weekend round of NFL matches, you can find an American Football section, whereas by the following Tuesday, you won’t see this section at all. You’ll find all the most popular sporting events to bet on, but this exchange may leave you disappointed if you want to bet on something a bit random. Also, you won’t find the same range of betting markets on the big matches as you do with Betfair. For example, there’s no first goalscorer betting on football, which is a pretty popular market. It’s no exaggeration to say that Betfair blows Smarkets out of the water on this category. The range of bets available is simply far superior. Liquidity is also generally better with Betfair, although that shouldn’t be an issue for most bets on Smarkets either. Betfair charge commission on net winnings on a market. For new customers, the basic rate of commission is 5%, although you can reduce this gradually by earning Betfair points when you bet. The discount rates are shown in detail on the Betfair website but basically, the more you bet, the more of a reduction you get. In theory, you could end up paying just 2% commission, but you would need to have paid a whopping total of £15,000 in commission before getting to that stage. Smarkets have a flat commission rate of 2%, which is applied to net profit on all betting markets. It’s one of the best rates you’ll find with any betting exchange out there, with only Matchbook offering a lower rate of 1% (although they also charge commission on losing bets too). In the grand scheme of things, paying 3% less commission on your wins might not seem like a big deal, but it’s worth noting the difference in any case. Tip: Let’s look at how that translates in a real betting situation. As you can see below, the available back odds were the same on both exchanges for this World Cup qualifying match between Slovenia and England. Let’s imagine that we placed a £10 back bet on Slovenia at odds of 6.8 with both exchanges. In both cases, the back bet would stand to make a profit of £58 if it won. With Smarkets, you would pay £1.16 commission on that profit, whereas with Betfair you would pay £2.90. That’s a pretty significant difference for a single bet. So in the Smarkets vs Betfair commission clash, it’s an important victory for Smarkets! Their 2% rate is clearly more advantageous to bettors than the basic 5% rate with Betfair. 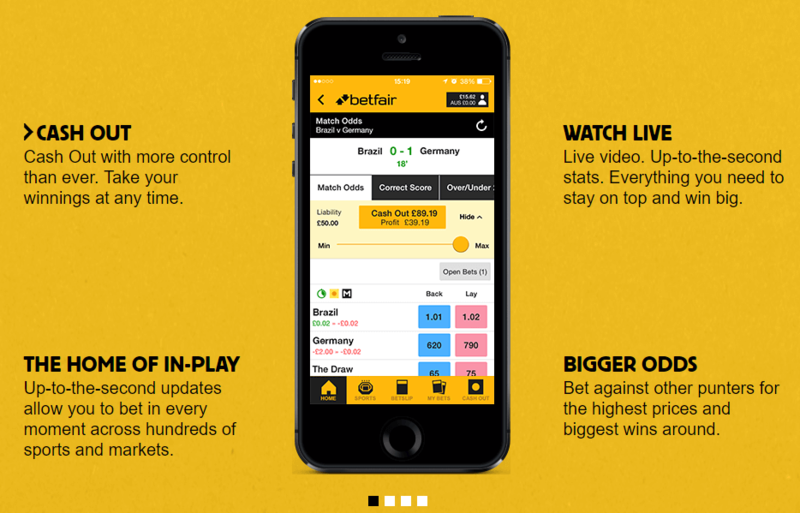 Betfair has a dedicated Exchange app for Apple or Android devices, which offers all the main functions from the website. You can sign up, claim your welcome offer and of course place your exchange bets via the app. Other features are available too, like cash out, in-play betting and live video, meaning you get more or less the full Betfair experience from your mobile device. The reviews on this app are solid enough, without being stellar. Meanwhile, Smarkets are lagging a little way behind with their mobile offer. They don’t yet have an app, although that appears to be in development, so we will be able to make a fuller comparison then. For now, you’ll need to use your mobile browser to bet with Smarkets on your mobile, which some will see as an inconvenience. The mobile website is generally reliable, but the newest version seems prone to bugging from our experience. It’s another hands-down victory for Betfair in this category, which is perhaps to be expected given their much longer experience in delivering mobile betting to their customers. We don’t want to criticise Smarkets too much on this count and we’re looking forward to testing out their mobile app when it is ready. The Betfair live betting experience is really a pleasure, as with its sportsbook product. Liquidity on the exchange markets is good, while many events have head-to-stats and live video to help you follow the match you bet on. Betting in-play is just as simple as pre-match, although there may be a slight delay before your bet is accepted, which is standard with all bookmakers. Smarkets doesn’t currently have live streaming, but in-play betting is available on many events. You can generally bet on the same markets in-play as pre-match. Although you can’t watch any matches, you can follow scores and see a log for football matches, detailing events like attacks, cards and goals. The ‘Instant Match’ feature allows your in-play bets to be confirmed without being subject to a time delay, although they will still be pending for a period of 8 seconds. Betfair has the edge when it comes to live betting and streaming, although Smarkets has some promising features. The Smarkets vs Betfair results are in and they are pretty conclusive. The big daddy of betting exchanges might be feeling the heat from new competitors like Smarkets, but is still a clear winner in this head-to-head. 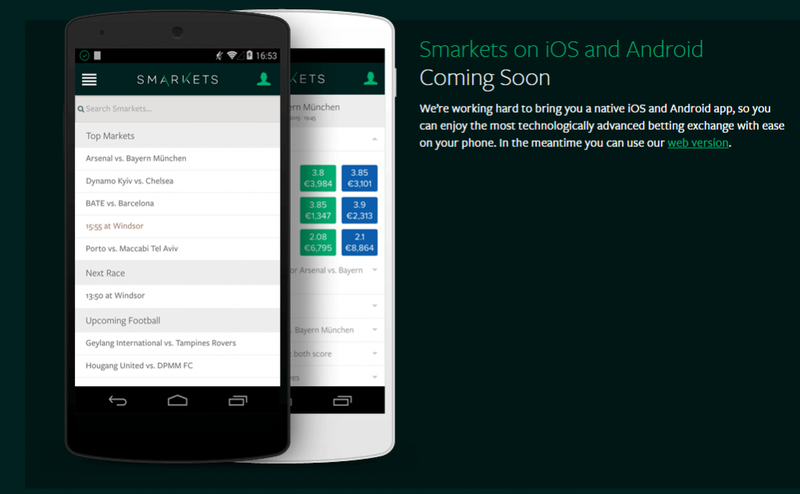 Smarkets impresses with its simple user interface, which is easy to use and distraction-free. However, it’s lacking on certain features; which means Betfair comes out on top. Betminded » Online Betting guide » Smarkets vs Betfair: Which betting exchange suits you best?